As seen on BBC’s “Normal for Norfolk”. 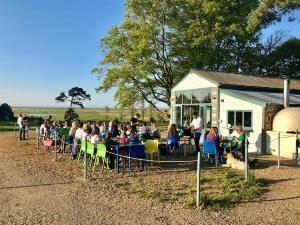 Situated on a farm off the A149 Coast Road between Blakeney and Cley the café enjoys views across the marsh and out to sea. Specialising in wholesome food with a changing seasonal lunch menu. Serving Tapas on Fridays and Saturdays from end of April. In school holidays Wood Fired Pizza Sunday to Thursday evening. Cooked Breakfast served daily. Next door a shop selling gifts, cards, toys, fruit and vegetables from the farm when available. Giant Maize Maze open from July to September. Historical Tour of the Garden with Desmond MacCarthy most weeks throughout the season. Open from 28th March until 20th December. Please see website for further details.